I felt the need to write this post covering some general tips for beginners, since many a times I receive mail, asking for help, to which the answer in most cases involves carrying out some basic troubleshooting. This article therefore touches upon some common steps a Windows user may take in order to try to fix or repair his/her Windows 8 computer. OK, so something has gone wrong or something is not working the way you want it to – and you want to fix it! 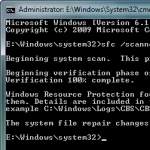 The first thing to do is to try to restore your Windows computer to a prior good point. To do so, open Start Menu > Accessories > System Tools > System Restore. Or else, simply type rstrui.exe in your start search and hit Enter. This will open System Restore. Here select a prior good point, where you know that you were not facing this problem and try to restore your computer to this point by clicking on the Next > Finish button. Once Windows completes the restoration process and restarts, check if your problem has gone away. The Windows Club Windows troubleshooting. permalink. Since most of us are not tech geeks, these simple tips work great in some circumstances.